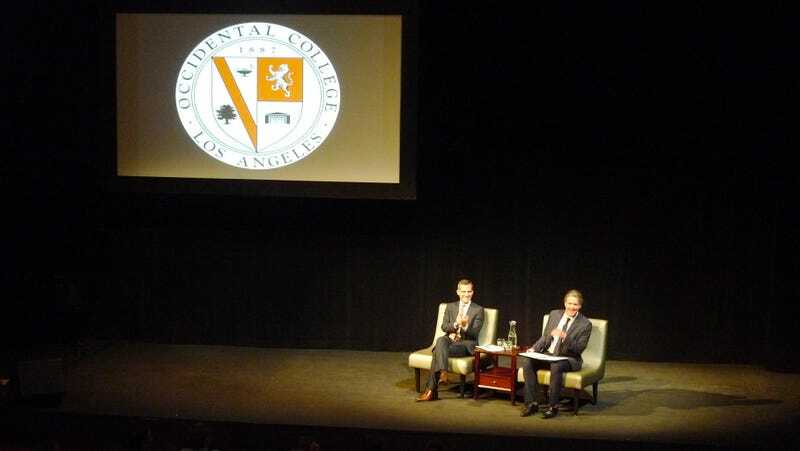 The Mayor of Los Angeles Would Like to Introduce You to the New L.A.
"I want to set some ground rules for what I think we all should do in L.A., which is to really resist cliché," stated Los Angeles Mayor Eric Garcetti last night during a future-focused public event at Occidental College. While "certain publications"—which the mayor did not name, but we all know who they are—like to make L.A. into a story of density vs. sprawl, pedestrian vs. car, he said, it's never that easy to define us. "There's a sense that Los Angeles is changing in some very profound ways," agreed Los Angeles Times architecture critic Christopher Hawthorne, who moderated last night's conversation. "I think what people are really interested to hear about is the mayor's perception of that change and his vision to shepherd that change along." By way of provocation, Hawthorne started with a series of L.A. images. The legendary Julius Shulman shot of a glittery urban grid below Case Study House #22. The car-free roads of downtown during the open streets festival CicLAvia. Joaquin Phoenix gazing over a skyscraper-strewn L.A. in Her. In a way, these represented L.A. past, present, and future: a visual trajectory that begins with our global recognition for the single family house, to a slow shrugging off of the automobile, to a dense, vertical—and largely unknown—future. The last image illustrated a kind of "anxiousness" we're currently feeling about getting to that future, said Hawthorne. "What is the appropriate response to the way we design that city?" But the role of design, transportation and technology within the larger context of his leadership are still a bit vague. Several times last night, Garcetti emphasized that his priority is—first and foremost—to improve quality of life, something he even wants to attach metrics to (perhaps like the well-being index that nearby Santa Monica is pioneering). We need to become "organicists": people who listen to and understand the needs of the whole city, Garcetti said. "By doing that, L.A. creates the greatest platform for innovation, creativity, and for life anywhere on this earth." So how do we get there? Quality of life most impacts us when it comes to navigating the city itself, he added. Unlike his predecessor, who expanded the transit network as a series of empire-building dramatics, Garcetti has a more humanistic approach: "At the end of the day people just want to get home and be with their kids." This means not only tackling traffic but also creating self-contained neighborhoods that help Angelenos live more locally. Recently, the city's biggest transportation "solution" has consisted of widening our freeways, with the latest 405 Freeway construction closure—the not-so-adorably named "Jamzilla"—happening this weekend. Garcetti didn't seem to approve—"Widening the 405 is analogous to finding a slightly bigger sponge to throw in the ocean," he said, to laughs—but he hasn't really done anything to stop our gluttonous highway expansions, other than suggesting a subway to run beneath the 405. What about removing freeways? asked Hawthorne, referring to successful, traffic-mitigating highway removal projects in San Francisco and other cities. "Could we find a little runt freeway and take it out of commission?" Garcetti said most likely not, but he offered a compromise: Because they do close freeways sometimes on the weekend for film shoots, how about the open streets festival CicLAvia taking over a stretch of highway? Another way to improve quality of life, of course, is a more robust rail system, something we'll see with the completion of the Expo Line to Santa Monica next year. But what about that fabled train to LAX? "If that's not underway by the time I'm gone, that's a good way to judge me," said Garcetti. The best plan, as he sees it, is to bring the proposed Crenshaw light rail line close to the airport and to remove auto traffic from the terminals. All passengers would enter the airport by car or train at a transportation center (near Aviation/Century on this map) where they would board a people-mover to get to all the terminals. The problem, of course, is funding. The LAX train might be started by the time he leaves office, but it's more likely that Garcetti's biggest accomplishments will be in the urban design realm. Last fall, he introduced the Great Streets Initiative—his first executive directive—which focuses on creating pedestrian-enhanced streets for dozens of neighborhoods. While short on details last night, Garcetti gave an example of the neighborhood of Atwater Village, where the business district on a very wide and dangerous stretch of Glendale Boulevard had benefitted from improvements made as part of a "pedestrian-oriented overlay zone": medians with trees, cafe seating, diagonal parking, wider sidewalks. The neighborhood was recently named best in the city at Curbed LA, he said. "We can revitalize these villages one at a time." Remaking L.A. streets would be a fitting legacy for Garcetti. He was an early supporter of CicLAvia and was instrumental in appointing the city's first pedestrian coordinators at LADOT, who are now implementing the ped-friendly People St. program. He's adding 40 miles of bike lanes a year as part of the bike plan, including the city's first separated cycletracks proposed as part of the MyFigueroa streetscape improvement project (above) for downtown and South L.A. (Garcetti publicly stated last night that he supports the project, which is currently facing serious opposition.) He also plans to expand the city's urban design studio office, which currently consists of one person, into a three-person committee. This would give support to transformative public architecture projects like schools and libraries, as well as the city's ongoing river revitalization, which he equated to a High Line for L.A.
Garcetti's commitment to urban design will also be seen in the success of re:code LA, an ambitious plan to rewrite the city's zoning code, which has not been updated since the 1946. Garcetti cautioned that it's not necessarily changing the zoning of L.A.— "community plans will change zoning"—but re:code LA will help translate elements of the zoning code into human language. "The reason to rewrite our zoning code is that it's so difficult to do business here," said Garcetti. "We're trying to simplify so people can really understand what their city is all about." This is where we'll also be able to watch his prowess with managing open data and working with tech leaders. In a blissful departure from the dry Q&A format, Hawthorne asked songwriter Gabriel Kahane to perform two songs as part of a musical interlude. The topics of Kahane's songs seemed to bookend the conversation perfectly: One about the demise of the Ambassador Hotel, widely considered to be the greatest architectural loss in the city, and one about the propensity for cinematic villains to live in the white-box Modernist houses which dot the landscape. But the songs also illustrated two of the worst L.A. clichés that Garcetti challenged us to check at the door: our architectural amnesiac lifestyle where we erase our history on a whim, and how we're out of touch with city living, locked in our pristine single-family film sets perched ominously on the hill. It's not going to be easy to get from the isolated glass cube of our living rooms to a truly public-focused, park-loving, bike-friendly, transit-savvy culture. In a way, we have to convince ourselves of what it will look like first. Garcetti's simple call to bust all the old stereotypes was pretty decent advice that I hope will guide his administration and leadership. We're a city that's great at telling stories but coming up with that new narrative for ourselves might be our biggest design challenge yet.